The Spa by Cinq Mondes of our hotel in Dax offers you an Art of Life space: sports and fitness rooms to take care of you, group classes to play sports and have fun, coaches at your disposal to offer you an adapted and tailor-made program. Yoga is a philosophy of life that promotes harmony between body and mind. The practice of yoga, a word that means “union” – of the body, mind and soul -, is based on the work of postures – also called “asanas” – and breathing, which promotes concentration and meditation. In a bright and comfortable room, our qualified teacher offers you group yoga sessions to take care of your body and mind in a warm and friendly atmosphere. You can devote yourself to Vinyasa Yoga, a discipline that aims at harmony and synchronization of movements on the breath. Throughout the course, your teacher will teach you to perform a dynamic sequence of movements, initiated and harmonized by breathing, adapting to the level and needs of the group of students. Discover the yoga sessions proposed by Florence… she shares all her secrets with us in her article, to be discovered here! Welcome well-being into your life: that of the body, but also that of the mind. Our spa in the centre of Dax has a fitness room equipped with various cardio-training equipment with free access for Aqua-Sensor course subscribers and hotel guests. Open every day from 9:45 am to 7:45 pm, it has running mats, bicycles, rowers and air conditioning, to allow you to disconnect during a working day, or to return to your activities in top form after a holiday or a weekend spent in the Landes. Reprogram your body with personalized support based on muscular and cardiovascular endurance. Our qualified teachers offer personalized and adapted courses for all levels. Each session is varied and balanced in order to adapt as well as possible to your present moment and your rhythm. Let our coach help you, who will motivate and guide you throughout your program to help you assimilate the right postures and movements and make you evolve very quickly. Lie down, close your eyes… and enjoy this unique moment of relaxation. Thanks to the pulsed jets, this hydromassage bed offers you a personalized massage without contact with water, your muscles are softened and relaxed, your blood circulation stimulated and your metabolism activated. For 3 minutes, you are installed in a cabin and exposed to a temperature range from -110C° to -180C°. The temperature of your skin is significantly lowered (by about ten degrees). The body temperature remains stable: the body does not freeze because the air in the capsule is completely dry. This technique promotes sports recovery, relieves pain, sleep disorders, and improves circulation and toxin elimination. (On reservation only, depending on available slots). Vacufit is a technology that combines the unique combination of physical activity and vacuum to restore a slim and firm silhouette. A 30-minute session is equivalent to 2 hours in a traditional sports hall. Installed in a sealed box, you walk on a treadmill. The effort provided will be amplified by the vacuum phenomenon stimulating the metabolism and the blood and lymphatic circulation. The suction work naturally activates fat elimination and reduces cellulite and orange peel skin, while improving your physical condition. The treatment is ideal as a 10 and 20 session cure. Several experts and wellness practitioners are at your disposal and offer you consultations in osteopathy, sophrology, reflexology, naturopathy… to take care of your body and mind gently. The sessions develop healing energies through body relaxation, positive thinking and visualization. They will allow you to reach peaceful inner states, allowing a reunification of all aspects of being: physical, physiological, emotional, mental and spiritual. Sophrology brings relaxation and well-being, confidence and autonomy… and a better knowledge of oneself, which allows to take a new look at one’s actions and life. This treatment may focus on the whole body or only on a specific part directed by your practitioner. This aims at a strong feeling of well-being, as well as a deep and lasting relaxation of the nervous system. Reflexology takes into account the whole person, without diagnosis, prescription or discontinuation of treatment. In order to produce the desired effect, the stimulation is adapted, since each foot structure is different and each body is different on the hormonal, emotional, physical, energetic, functional levels… This treatment combats the effects of stress on the body while restoring the general balance of the body. Reflexology is thus regenerative. Bioenergy is based on the fact that each individual is composed of energy fields and that any physical or psychological pathology is linked to a disruption of these fields. Bioenergy measures and analyses energy fields, identifies and corrects imbalances. It is through a moment of targeted relaxation that letting go becomes possible. 32 points on the head are gently activated. Intense relaxation releases the electromagnetic charge that holds the thoughts, attitudes, emotions and feelings you have accumulated in place. Naturopathy is a set of care methods aimed at strengthening the body’s defences by means considered natural and biological – WHO definition – It makes it possible to support people suffering from both acute and chronic diseases, or simply helps them to regain a healthy lifestyle. Shiatsu is a manual method of care using mainly the thumbs, but also the other fingers and palms of the hands, corrects an internal dysfunction, promotes and maintains health, and treats specific conditions by reactivating the individual’s natural capacity for self-healing. Aquatic osteopathy like tabletop osteopathy makes it possible to work on joint blockages, muscle and digestive tensions in order to relieve pain with hot water, which allows total relaxation. This treatment allows the relaxation and reharmonization of the fascias (enveloping the muscles and viscera). It is a psycho-energetic method that uses the scents of certain essential oils to help everyone to free themselves from blockages linked to the past and to find a psycho-emotional balance in the present life. Olfactotherapy accompanies anyone who wishes to be reconciled with their history and themselves. This treatment combines the benefits of Olfactotherapy and energy massage. 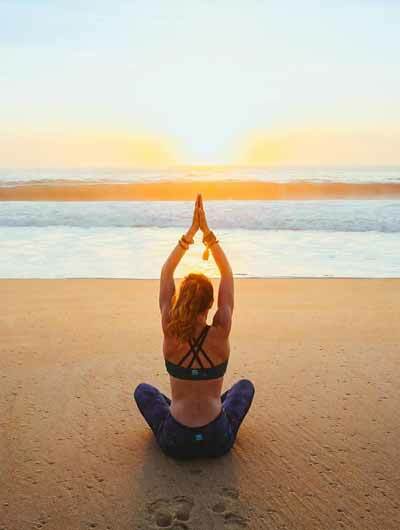 While working on muscle and nervous relaxation, a realignment of the physical and energetic bodies takes place through a deep anchoring to the earth, a dynamization of energies, and a re-harmonization of the chakras.